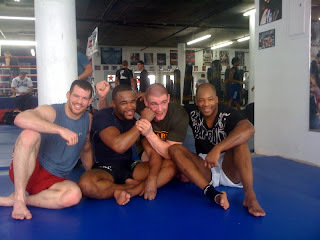 Here's @SugaRashadEvans, Tom Murphy, Dave L'ouiseau and me after practice today. Afterwards, Tess and I ate with Brendan Schaub and his girlfriend, Andrea. Then, I got a massage and now I'm getting ready to work out with Chaimberg.